Wave Power Conundrums: Does Falnes's wave maker diagram apply to all WECs ? Does Falnes's wave maker diagram apply to all WECs ? I'm not surprised now, as Falnes's early experimental work was on point absorbers. Nevertheless I only found out that the wave absorber = wave maker diagram was specific to point absorbers when I tried to see if it could explain the way that the Edinburgh Duck captured wave energy. I realised that large devices needed to radiate energy in the opposite direction to that shown in Falnes's diagram. 1) Amplitude condition: the radiated wave must have the same amplitude as the incident wave. 2) Phase condition: the radiated wave must be in anti-phase with the incident wave. Next, I'd like to consider the distinction between the behaviour of bodies that are small compared to the waves, and bodies that are a similar size to the waves, or bigger. A very small stationary body has negligible impact on the incident wave field. A very large stationary body changes the incident wave just by being there. It sends some of the incident wave bouncing off in other directions. We can describe the wave field observed around a large stationary body as the original incident wave (in the absence of the body) combined with a diffracted wave. In front of the obstacle - a reflected wave interacting with the incident wave: this interaction would look like cross-hatching (Fig 2) if the reflected wave travelled at an angle to the incident wave, or like a standing wave if the reflected wave travelled in exactly the opposite direction to the incident wave. Behind the obstacle - a transmitted wave, which would be smaller than the incident wave in the absence of the obstacle. 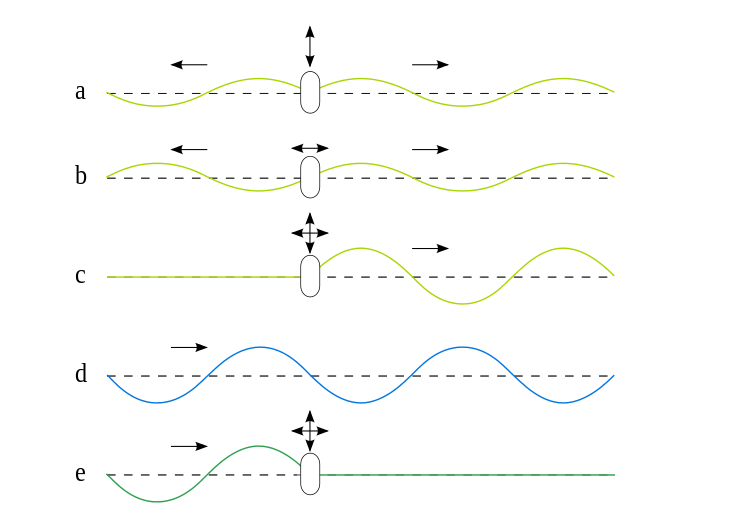 Both these observed reflected and transmitted waves are in fact the incident wave combined with the diffracted wave. I, the observer, have decided to split the water surface into pre- and post-obstacle, and name the observed waves in these areas the reflected/incident and transmitted waves. 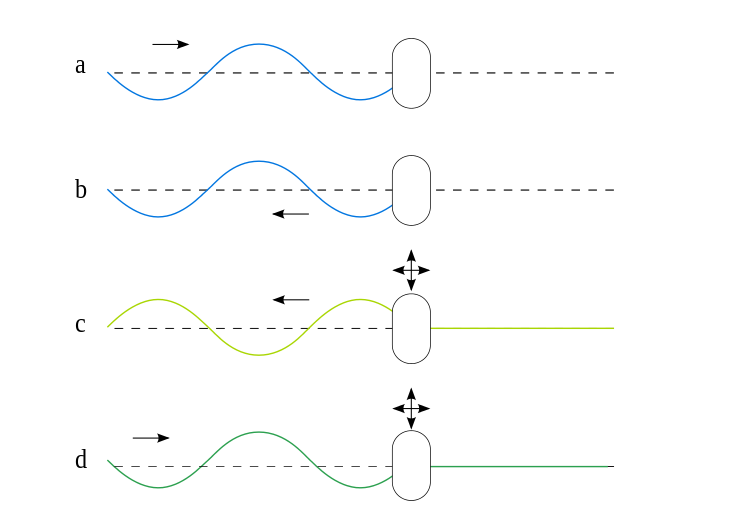 Looking closer at the wave absorber = wave maker diagram (Fig 1), it reveals itself as being specific to point absorbers: the incident wave (d) experiences no reflection; it is completely transmitted, as would be expected for a point absorber. In Fig 3, I've amended the wave absorber = wave maker diagram to make it more obviously specific to a point absorber. First, I've emphasised the body's small size compared to the waves. Second, I've added the stationary body to the incident waves (d) to show that all of the incident wave is transmitted. 1) Amplitude condition: the radiated wave must have the same amplitude as the transmitted wave. 2) Phase condition: the radiated wave must be in anti-phase with the transmitted wave. Next I will consider the opposite extreme: a subset of large bodies commonly known as terminators. My definition of terminator for the purpose of this discussion is a body that does not allow any of the incident wave to be transmitted, when it is moving or stationary. 100% of the incident wave is diffracted. 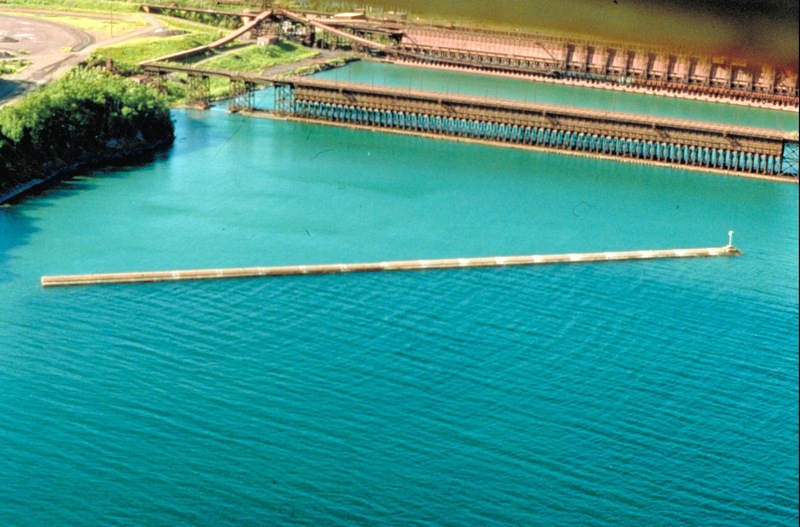 An example of a perfect terminator is a solid sea wall supporting OWC chambers or pitching flaps. As the absorber is mounted on a sea wall, this forms a boundary to the incident wave; it stops here. In this special case, the reflected wave is the diffracted wave. Fig 4 shows the case where all the incident wave (a) is reflected (b). Again, motion that produces a combination of symmetrical and asymmetrical waves can radiate a wave in one direction (c) only, but this time it is necessary to radiate waves towards the incident wave (a). 1) Amplitude condition: the radiated wave must have the same amplitude as the diffracted wave. 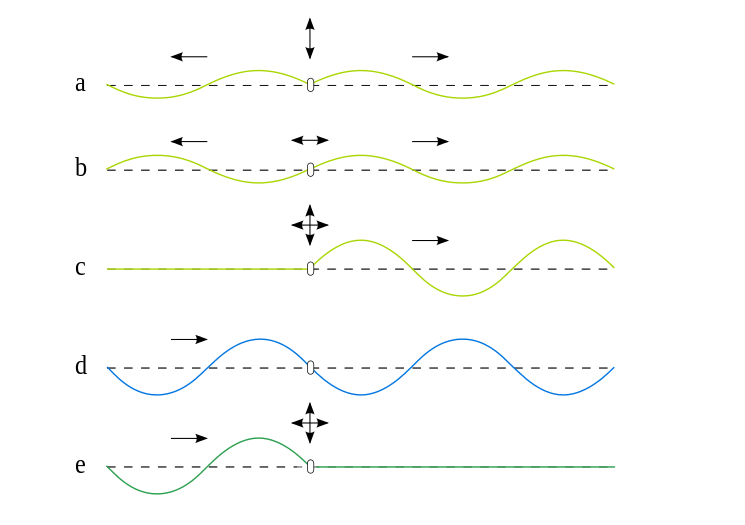 2) Phase condition: the radiated wave must be in anti-phase with the reflected wave. yes, the principles depicted in the diagram apply to all WECs. Can a photo demonstrate percentage of wave power absorbed? Falnes'sdiagram: just a bunch of maths? Doctor doctor! I see waves before my eyes! Travel theme. Theme images by Naseko. Powered by Blogger.